Rankings of the Best Medical Schools in the USA. *Official Ranking by Medical School Admissions Experts. Author of Bestselling Book, "Dr. Prep! How to Get Accepted to the Best Medical Schools." Click Above to Purchase Exclusive List. These are the latest medical school rankings and updates for this year based on the newest admissions data released by the AAMC (Association of American Medical Colleges). Our rankings of top medical schools will help guide you to making an informed decision on which medical school is best for you. Are you searching for the official ranking of the best medical schools in the world... and USA? Well, we've done the research for you so you can decide which medical schools are the top medical schools for you to consider - for pre-medical students and current doctors - who want to know the best medical school rankings by specialties and research. The medical school official rankings are updated every year by our experts. What makes a medical school great? And what factors go into your official ranking of the best medical schools in America (and the world). Well, there are a number of well-researched factors that make a medical school "elite" or "exclusive," most notably their peer ranking, research grants/funding, and several factors listed below such as selectivity, MCAT scores, and USMLE scores of medical students applying to residency programs. Overall TTP Score (Weighted towards career speciality and potential salaries after practicing medicine). Within this official list of the best medical schools (To Download Click Here), we're also adding our bestselling book on admission to medical schools called "Dr. Prep! Top Secrets How to Increase Your MCAT Exam Scores, Master Your Medical School Admissions Interview and Become a Doctor," a 90-minute session with the World's Leading Expert on Medical School Admissions, and lifetime access to access these best medical school rankings, anytime. You can also share this best medical school list with friends, family, colleagues. And be sure to READ ALL the way to the bottom as we've got some surprise insider tips to share with you on the medical school admissions process, strategies, and ways how to get accepted to the most selective (highest/lowest acceptanct) medical schools. Best Medical Schools in the United States - Official Ranking by Med School Admissions Experts. It's really hard to get accepted to the best medical schools, but downloading these medical school rankings will help you gain a HUGE advantage. I think you'd agree with me that getting accepted to top medical schools is getting tougher each year. Right? With admissions rates in the sub-5% range for some of the best medical schools, you need to have every advantage necessary to win, including the research data that shows which schools are the most selective, offer the best opportunities for career advancement, and provide you the best possible medical education to become a doctor. More than 10,000+ students have downloaded our best medical school rankings/list and you can too. There are tons of awesome things included with your lifetime membership on your path to becoming a doctor. Because we know it's very challenging to get accepted to these medical schools, our admissions formula - and MCAT test prep - can help you gain admission to elite schools like Harvard Medicine, Washington University (St. Louis), Stanford University, University of Pennsylvania, Johns Hopkins Medicine, Duke University, Cornell University, New York University, Columbia and many more top 25 medical colleges and universities. In these medical school rankings, we focus on the nation’s best schools. And we call these medical schools the best in the world, because frankly there aren't any better schools for studying to practice medicine, than in the United States. Most of them are located in America (The United States), but some medical schools do offer international study and research fellowship opportunities - Stanford, Cornell, Penn, and Columbia - are four medical schools that do in fact offer these programs. Maybe you're not looking to apply to the most difficult/lowest acceptance rate medical schools... does that mean you shouldn't buy this exclusive rankings list? These medical school rankings are for every pre-medical student who's considering applying to medical school. Why? I consider our advice like training for a four-minute mile. By following our recipes for success, you will be ready to apply to any medical school from coast-to-coast - from Harvard Medicine - Stanford University to a state medical college like University of Texas (UT-Austin) to the University of Washington. Even if you are not the next Roger Bannister, who in 1954 was the first person to run a four-minute mile, preparing at this level will only strengthen your chance of meeting any other goals. The good news, however: If you go through the process as if you are applying to the nation’s elite medical schools, you will increase your chances of getting into every other med school. What's included when you purchase these "America’s Top Medical School Rankings." Signed and newest released bestselling med school admissions guide - Dr. Prep! So what factors go into Top Test Prep’s official med school rankings? The Association of American Medical Colleges (AAMC ©) has 150+ members in the United States and Canada. There are 20 times more four-year colleges and universities in the United States than there are medical schools. Suffice to say that getting into medical school is incredibly competitive. As you begin surveying the landscape and mapping out your plan to get into medical school, I recommend that you aim for the nation’s best medical schools. These medical school rankings (and Bonus Med School Admissions Guide which is Included) is for every student who is considering applying to medical school. Your heart might not be set on the Ivy League, Washington University in St. Louis, Johns Hopkins University or some other great medical school, but by heeding our recommendations you will put yourself in a good position to matriculate to the school of your choice. Some of you will think about what has become the easy way out: offshore medical schools. I caution you not to do this and instead meet the challenge of getting into medical school head-on with all of your energy and enthusiasm. Many students from offshore medical schools encounter difficulty when trying to return to the United States for residency programs. Those same students could have gained admission to American medical schools in the first place had they demonstrated the necessary motivation. Follow our advice, put your heart into it and you will find the U.S. medical school that is right for you. So what other critical factors go into our official best medical school rankings? How selective a school is. While being a measure of selectivity is not the only reason to rank a school highly, it is a measure of a school’s desirability. How many applicants accepted to a school actually enroll at that school. A low acceptance rate does not necessarily translate to a high yield rate. For instance, Stanford University has an acceptance rate below three percent, but its yield rate hovers around 50 percent. The largest source of funding comes from the National Institute of Health (NIH). Schools that get the most funding from NIH tend to have strong research programs. A way of measuring how many of each medical school’s graduates get their top choice or one of their top three choices of residency programs. Each March, fourth-year medical school students have Match Day, where they learn which residency program they will attend based on the National Residency Matching Program. For the record, our medical school admissions experts have combed through thousands of data points and statistics about medical school admissions. Our rankings put more weight on neutral input data, such as MCAT score, grade-point average and NIH funding, which annually remains static. One could argue that UCSF should be ranked in the top five of all medical schools because of its NIH funding. Similarly, one could argue that other schools belong in the top 10 because of their ability to train primary care physicians. The schools in our top 10 and our five Rising Stars will be in every top 20 ranking, regardless of the category that means the most to you. As you can see, most students admitted to medical school boast top-notch grade-point averages. And of course they score well on the MCAT. Some schools have different approaches to education and learning, but in general there is a great deal of trust placed in students to work hard and learn the craft. While it can be said that an M.D. is an M.D., some M.D.’s have a better quality of education than others. If you are vying to become an esteemed physician, your path will be ineffably bolstered if you graduate from one of the top 25 medical schools in the United States. If you’re applying to the schools in our medical school rankings, buckle up: what you're about to purchase (this exclusive list) will help guide you through every step of the process. And again, if you’re not applying to one of these schools, the tips, pointers, and candid advice we provide will help you no matter your situation. You should consider including at least a couple of these schools on your list. You never can go wrong aiming for the best. Click Here To Purchase (Buy Now). Not only will you receive instant access to year's of data and research on these top schools, but you'll also get plenty of extra bonuses added into these med school rankings. We've evaluated more than 150+ medical schools and awarded 7 of the best medical schools these awards above. These awards are updated each year as we refine our rankings and add/subtract schools from our list. We also only chose the best medical schools in our primary list, so you can save time and focus on the hardest schools in which you'd like to get accepted. We researched, wrote, and distributed these medical school rankings to help thousands of pre-med students just like you who seek admission to the most competitive graduate program in the world: medical school. The medical school admissions process is unlike anything else you’ve ever seen. You will be tested repeatedly: from your MCAT, which tests your understanding of core physical, biological and verbal reasoning, to the dreaded med school interview. You will be challenged and pushed to your physical and mental limit, pressured by your colleagues – probably your parents – and everyone around you. But who cares? Isn’t that the point? Life is tough and the more pressure you can deal with, the better doctor you’ll become someday. Whether you become an ER doctor, orthopedic surgeon, dermatologist, or radiologist - any specialty - patients will come to you seeking answers and you have to make tough decisions that have life impact. It’s intimidating but completely worth it…and your future patients deserve a top-rate doctor. Remember: the medical school admissions process is a marathon, not a sprint. The MCAT exam is almost 5+ hours, and students have literally passed out as they take their computer-based examination. We’ll make sure you don’t pass out. In fact, we’ll help you kick the crap out of the exam and walk around being the guy or girl who could brag about your MCAT score. Ok, and if you don’t like to brag, you can laugh inside as that Gunner in your sophomore year Organic Chemistry class brags about breaking a “30.” Big deal. So what. Don’t aim for a 30, aim for the top percentiles and let’s knock the MCAT out of the park together. Bonus tips to Prepare for your MCAT Exam .... Just Because... We want you to win. Medical School Admissions + MCAT Scores. So what are the attributes that the medical school admissions officers want to see? The test never goes away. It will follow you the rest of your career. It may not directly speak to your passion on why you want to become a doctor, but medical school admissions officers want to know that you can handle the rigorous academics of medical school. You need a top MCAT score to get accepted to medical school. That does not mean you have to be the homecoming queen or most popular person in your high school or college graduating class. You don’t even have to be the most outgoing person, though a splash of extroversion will definitely help. It is important that you are able to make others feel at ease around you, a skill that will be valuable as you pursue your career in medicine. 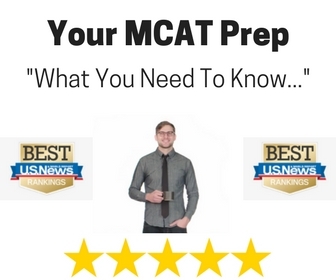 · Someone who knows how to take standardized exams such as the MCAT for medical school admissions. Yes, by this point you have taken the SAT or ACT, graduated from college, and taken the MCAT (hopefully scoring well on it). But you still will need to take the three steps of the United States Medical Licensing Examination (USMLE). A track record of scoring well on your entrance boards is indicative of someone who knows how to succeed on these tests and will do so again on the USMLE. · to complete your entire aamc application for medical school. Did you volunteer at a bunch of one-day events just to get credit for being there? If so, why have you not found a way to make a difference on a consistent basis for groups with which you worked? Did they not want you back? Or have you consistently worked with the same groups at multiple events? By continuing to work on the same projects and with the same people, you show that you are capable of being part of a team and that others want to have you on their side. If your experiences follow a consistent theme—such as volunteering with three different groups that help children with autism—that too will be taken into strong consideration. · A worldly, erudite pre-medical school applicant. Would you be embarrassed if, during an admissions interview, you attempted to explain Obama Care and its impact on the medical community? Or would you adeptly provide an intelligent answer? Many applicants will be stumped by such a basic question that pertains to the profession. The interviewer will not remember if you can answer questions like this on the hot topic of the moment—but they will remember if you cannot answer these questions. You need to be up-to-date on the news cycle and how societal events impact your and others’ lives. 1. With so many applications to read—especially with the ability to submit applications to multiple schools via AMCAS©—it is likely that an admissions officer will spend no more than five minutes looking at your application. They need to see and think, “Hmm, I want to meet this candidate!” If you have geared your undergraduate career toward going to medical school, an admissions officer will notice. If it looks like you are just going through the motions and are not convinced that medical school is for you, admissions officers will notice that too. 2. Conscientiously build your pre-medical school résumé. Do things you enjoy, but always be on the lookout for new opportunities, even if they are a bit outside your comfort zone. You never know how the skills you pick up might benefit you in the future. 3. MCAT Scores matter. Study hard. For better or worse, your MCAT score is one of the most important numbers of your life. Do everything possible to reach your potential on this test. Your MCAT test preparation should be at least 1 month full-time, and preferably up to 1 year if you can. And if you need extra help preparing for your MCAT, let us know! Now that you have your game plan: you're ready to begin, start with this purchase.